Workplace prosecutions are something that health and safety practitioners should maintain oversight of to identify trends. This article provides an overview of the prosecutions listed by WorkSafe Victoria and Safe Work NSW for 2015 as of 15 March 2016. 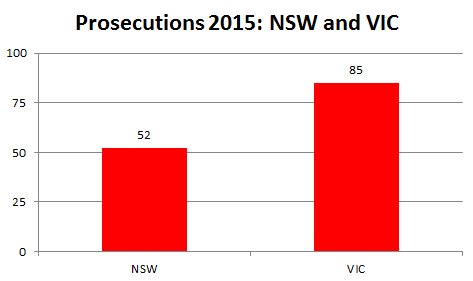 2015 saw a total of 85 health and safety prosecutions in Victoria and 52 prosecutions 52 in NSW. 1 prosecution was against the Explosives Act 2003. Interestingly, whilst the Occupational Health and Safety Act 2000 in NSW was superseded as of 1 January 2012, approximately 40% of the prosecutions listed in NSW during 2015 were against the superseded Act. The average fine in both states exceeded $50,000. In NSW the average fine was only slightly greater when comparing between the current and superseded legislation; however, the amounts for both: (i) median fine ($80,000 v $47,250), and (ii) the greatest fine (412,500 v $300,00), were greater when prosecuted against the current legislation. This is in line with the guidance that was provided on enactment, that penalties would increase when the harmonised Work Health and Safety Legislation was introduced. In NSW each prosecution resulted in a monetary fine. In Victoria 59 fines were issued (69% of the total prosecutions). In addition to the fines, WorkSafe Victoria issued seven (7) Enforceable Undertakings. In these cases, the enforceable undertaking is a legally binding agreement between WorkSafe Victoria and the employer. The employer is obliged to carry out the specific activities outlined in the undertaking. Such scenarios ensure that the workplace implement agreed corrective actions. Failure to preserve incident site – 8%. Assess their workplace risks. Workplaces should consider listing all foreseeable hazards in the workplace, and document the current controls that have been implemented to support the management of the hazard. At this time, the workplace should consider additional/ alternative control strategies. If the risk associated with the hazard can be further mitigated, this should be documented with a Safety Action Plan developed to support implementation. Consider safety when procuring equipment. Often safety is an afterthought. Considering safety prior to purchasing will better ensure that controls do not require retro-fitting and/or additional equipment is not required to manage the “new” hazard presented – both having financial implications. Considering safety when engaging contractors. Workplaces often engage contractors to support processes that they are not familiar with, which means new hazards may be introduced to the workplace. Prior to engaging contractors, along with price, seek information from those you are about to engage to ensure that they can maintain that safe working environment you have established. 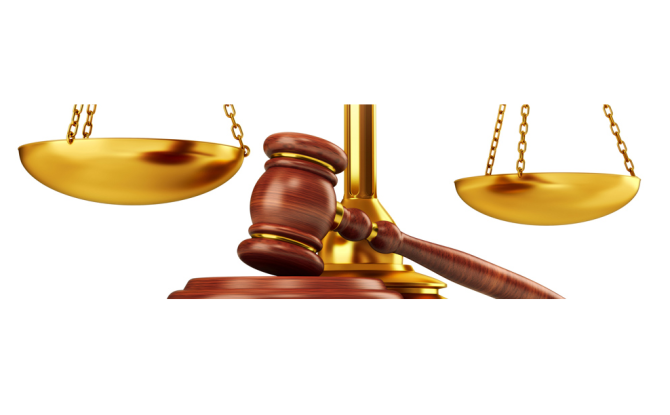 Guarding and maintenance of plant equates for over one third of prosecutions. Guarding is a high level control that ensures there is separation between workers (and their limbs) and moving parts. Management and supervisors should be undertaking regular walk-throughs to ensure that guarding is not overridden. The guarding that management and supervisor walk past is the fatality and/ or amputation that they accept. Where guarding has been removed, management and supervisors should talk with the operators to understand the basis for this. Are operational KPIs realistic? Can processes be reviewed? Is the plant fit for the purpose that the workplace wants? Is additional equipment required? Worth a mention is the 16% of workplaces that failed to notify WorkSafe Victoria of the notifiable incident that occurred in their workplace and the 8% of workplaces that failed to preserve the incident site. Both of these requirements are expressed clearly within the Occupational Health and Safety Act 2004. If your workplace is not familiar with what incidents require notification, or there is no training or reference in your procedures on how to manage a notifiable incident – it is something you should consider reviewing immediately. Finally, apart from legal fees, fines and a negative prosecution result, the lengthy duration of legal proceedings can impact workplace resources (e.g. with conflicting focuses between the prosecution and workplace safety). The impact also flows through to other areas of the business resulting in a negative safety culture, low morale amongst workers as well as the negative impact on business development due to ‘loss of faith/brand damage’ that is perceived by the general public.